The paper proposes a methodology and a tool-based support for the development of semantic services in ambient-assisted living (AAL)-oriented assistive environments. A review of existing approaches in this area is conducted. The review covers a variety of AAL platforms from which universAAL has been chosen for the experimental implementation. The paper presented the iterative development methodology of service semantics, which facilitates the efficient creation of error-free services in AAL platforms. The features needed for the realization of the methodology are implemented as a universAAL platform extension named the annotation-based semantic enrichment. The proposed approach is assessed in the context of a sample scenario in which the services promoting universal access for elderly people or otherwise impaired persons are developed. The assessment results are used to highlight the added value of the presented work and to identify potential areas of future improvement. 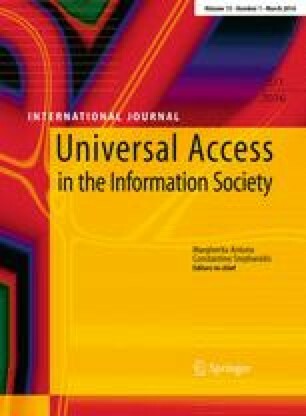 An important group of people on which recent research on universal access is focusing is the elderly [2, 14]. This is caused by the demographic changes—particularly in Europe—which result in the increasing population of the elderly people in society . The concept of universal access is addressed, among others, by assistive environments which—in addition to enhancing accessibility—increase the general quality of life. A research domain on assistive environments directed at elderly people is referred to as ambient-assisted living (AAL). In response to the demographic changes, AAL leverages the potential of Information and Communication Technologies (ICT) to extend the period during which elderly people and people with disabilities can enjoy a healthy, safe and happy life on their own [1, 31]. There were many research initiatives focusing on the exploitation of ICT in applications from the AAL domain [6, 18, 19, 21, 22, 23, 26, 30, 34]. Unfortunately, developing AAL applications without a common framework has proven itself to be ineffective and cumbersome . Therefore, the aforementioned initiatives tried to standardize the development process by introducing the concept of a platform [3, 12]. The exact definition of the AAL platform varies, but the common denominator is that it typically provides an environment for constructing applications from a set of reusable business services, which can be easily composed and supported by the system services provided by the platform itself. An important feature that should be provided by the AAL platform is a mechanism for expressing and handling service semantics. The semantic information is crucial for the effective composition of the services and choosing the service instance, which is the most appropriate for the current situation . This is especially important in the context of universal access. For example, when a visually impaired person approaches a tourist information terminal, the terminal should detect the disability and automatically select the voice modality channel as the service providing the most appropriate user interface from the semantic point of view. Critical evaluation of the Methodology and its implementation (AAPI) in a meaningful scenario from the universal access domain. Throughout the paper, the process of adding semantic meta-data to the services is often referred to as development or implementation of the semantics. This allows the text to be more concise without losing its full meaning. The structure of the paper is as follows. Section 2 presents a review of research in the field of AAL platforms and highlights the aspects related to semantics. The Iterative Development Methodology of Service Semantics is described in Sect. 3. The description is divided into motivation— Sect. 3.1 and the actual Methodology description— Sect. 3.2. Section 4 presents the Annotation-based Semantic Enrichment (AAPI), which allows for realization of the Iterative Methodology in practice. The evaluation of the proposed solutions in a real-life scenario is presented in Sect. 5. Finally, Sect. 6 concludes the presented research and discusses the improvements which will be addressed in the context of future work. Many research initiatives attempt to address issues related to universal access with the use of semantics. Some of them, such as [9, 17], describe solutions that provide universal accessibility and interoperability in the context of user interaction allowing for adaptation of the application interfaces to specific user needs. Others [8, 25] leverage the concept of the Semantic Web to propose an approach for profile-dependent accessibility of data for end users. Since the paper’s contribution is focused on the AAL domain, the following section analyzes available AAL platforms and their features related to development of semantic aspects of services. SOPRANO is an AAL platform oriented toward intelligent context adaptation by gluing high-level abstraction layers, such as planning and context, with lower layers, e.g., service and hardware, by means of a common SOPRANO ontology . The process of gathering events, reasoning about certain situation and, finally, invoking appropriate actions is decomposed into the following architectural components : (1) Procedural Manager—maintains high-level actions— procedures—and allows for triggering their invocation by Composer and Context Manager; (2) Composer— applies Match-making algorithms to choose service instances fitting an abstract semantic description; (3) Context Manager—receives events from sensors and stores them; it also enables subscribing to an event pattern. The development process in the SOPRANO platform involves several roles, two of which are specifically related to semantics: Device technology provider and Software developer. The Device technology provider creates and maintains implementations of sensors and actuators, which are exposed as services inside OSGi bundles . The Provider has to ensure that the services are semantically enriched with information from the SOPRANO ontology. This allows the Software developer to use sensors and actuators to combine, augment and aggregate context information into a rich and reliable semantic knowledge base which is then exposed to higher layers. Tasks related to managing the implementation of semantic aspects performed by the Device technology provider and the Software developer are demanding, yet the platform does not explicitly provide any mechanisms to reduce their complexity. One of the main objectives of the OASIS Project  was to provide an implementation of an Ontology-driven Open Reference Architecture that supports interoperability, connectivity and context sharing between services relevant to the domain of the elderly. The OASIS platform comprises several building blocks directly related to semantics: (1) Common Ontological Framework (COF)—stores the specification of relations between different ontology modules in OOR (OASIS Ontology Repository) and allows users to define a Hyper-Ontology, which optimizes the integration of different ontologies; (2) AMI Framework— provides seamless interactivity between services, applications and ontologies stored by COF; (3) Content Anchoring and Alignment Tool (CAAT)—aligns the functionality of specific services with ontologies stored in the repository; (4) Content Connector Module (CCM)—supports automatic integration of newly created services with incoming service requests using the AMI Framework. The process of developing solutions in the OASIS platform assumes the integration of services delivered by different providers in accordance with requirements specified by end users. Different functional parts of services can be composed into applications by exporting their functionality in the form of web-services that then are correlated by the AMI Framework with hyper-ontology to match the user expectations. The exposition and matchmaking of service functionality with user requirements is done automatically in a seamless way by the CCM. However, the overall process of services or device descriptions mapping to ontologies assumes manual approach and is time-consuming. The approach assumed in MonAMI —another OSGi-based AAL platform—focuses on simplifying the business environment for developing AAL services and, as a consequence, fostering the creation of relevant ecosystems . MonAMI achieves this goal by proposing an interoperability framework—OSGi4AMI where information and context are mediated in a seamless and transparent way. OSGi4AMI defines a comprehensive ontology, covering various devices and service types which are mapped to specific Java interfaces. The ontology brings clear separation between the application logic, device logic and other system components. This is a very valuable feature that greatly simplifies the work of developers during initial implementation of services and devices, as well as during system evolution, where a given service/device implementation may need to be exchanged. Unfortunately, the granularity offered by the OSGi4AMI ontology is very coarse—only interfaces and not the specific features are defined. Therefore, managing the ontology in a large-scale system covering many networks, nodes and diverse services becomes difficult. PERSONA project introduces a framework for supporting context awareness. This framework is implemented as an open middleware-based distributed system, based upon the OSGi technology. It offers semantic RPC and Match-making features  in the form of data buses (e.g., context bus, service bus). PERSONA enables the service provider to define ontological descriptions of services (ServiceProfiles) , which are then used by developers to develop business logic for specific profiles (ServiceCallees components). The client may use semantic information to describe the requested services and pass requests to the bus. Internal framework mechanisms perform semantic Match-making  between requests and the registered ServiceProfiles, select an appropriate ServiceProfile, and communicate the response to the caller. The proposed approach is very mature and offers advanced features for describing services in a semantic manner. However, the inherent complexity of developing ontologies and mapping them to specific implementations makes it error-prone and difficult to use. Moreover, support for evaluating the validity of request/service matches remains rudimentary. The universAAL project  aims at providing an open platform and reference specification of AAL on the basis of several projects (including SOPRANO, Oasis and PERSONA). One of the key goals of the project is to enable developers to easily create applications and reuse existing platform services that are shared within the developer community. To achieve this, universAAL heavily relies on ontologies and semantic descriptions of services. The process of applying semantic descriptions is simplified by providing several tools capable of transforming ontologies between different representations, such as OWL-s, UML, and Java. The platform provides mechanisms for semantic interoperability and Match-making, very similar to the ones introduces in the Persona project. However, the complexity of mapping semantic descriptions to specific business logic components remains high and requires broad knowledge about the ontologies themselves as well as the way in which they apply to a particular implementation. The presented study of ongoing work related to assistive environments indicates that there are many existing platforms and solutions which address enrichment of services with semantic meta-data. However, in all cases the inherent development process is either too cumbersome and error-prone (e.g., Oasis, Persona) or too much simplified for supporting real-life cases (e.g., MonAMI). This problem is addressed by a methodology proposed in the following section. This section firstly presents the paper’s contribution by describing a regular process of implementing semantics in AAL platform services. All problems and inconveniences of the process are described from the developer’s point of view. Subsequently, the section presents the Iterative Development Methodology of Service Semantics, which aims at automating some parts of the process and ensures constant control over the implementation’s validity. The platforms discussed in Sect. 2 handle service semantics in various ways; however, on the abstract level, all these approaches have several essential aspects in common. Such aspects are grasped in Fig. 1. Semantics are invariably based on an ontology. The ontology defines the Semantic Concepts which, in the AAL Domain, most commonly represent some fragments of the physical world . The Semantic Concepts are used to describe a Service from both the provider’s and the consumer’s point of view. The provider defines a Service Description that can be perceived as a contract, whose fulfillment is guaranteed. For instance, the contract may state that the invocation of the service will change the state of a given instance of an element modeled by the ontology. In turn, the consumer defines a Service Expectation, which represents a contract the consumer would like to see fulfilled. For instance, by invoking the service, the Consumer may expect to read the current room temperature from an appropriate sensor covered in the ontology. Both elements— the Service Description and the Service Expectation— constitute input data upon which the Match-making algorithm operates. The goal of the algorithm is to process Service Descriptions available in the current context (e.g., on a platform node or network segment) and choose the service (or multiple services, if permitted) which represents the best semantic match for the given Service Expectation. Of course, a situation may arise in which no Service Descriptions match a given Expectation—in such cases the expectation simply cannot be fulfilled by the platform. Figure 1 illustrates the elements of service semantics and their interrelations and the responsibilities for developing them. The developer at a provider side is responsible for the creation of the Provider Implementation. Such Implementation has to cover the service business logic and its Semantic Description. The Service Implementation has to be registered by the provider in the platform to expose the Service Description for the purposes of Match-making, and to allow for realization of service invocations. The consumer developer is responsible for implementing the relevant business logic at the consumer side and for adding there a suitable invocation taking into account the desired Service Expectation. The development of the ontology and the related Semantic Concepts is a shared responsibility. While most of the time, it would be handled by the provider, this is not mandatory. Implementing service invocation at consumer’s side. Two essential problems can be identified in the context of the development steps presented. The first identified problem is that the steps may prove complex and time-consuming, and there is no clear distinction between the business logic and the implementation of semantics. Often those two elements are tightly coupled with each other which makes either of them hard to reuse for other purposes. The second problem is that only after all the process steps are finished, the implemented code can be deployed to the platform and launched for the purpose of testing its correctness. If something goes wrong, it is very hard to determine who is responsible for the error—the consumer, the provider or perhaps the creator of the ontology, who may have committed a mistake during the modeling phase. In order to solve the problems identified in the previous section, the Iterative Development Methodology is proposed. The Methodology is presented in Fig. 2. It divides the development process into four iterations: A–D. Following each iteration, a certain status is guaranteed, as presented on the right-hand side of the figure. The Methodology assumes that the application is developed with the use of the Semantic Framework, which itself is an integral part of the AAL platform. In order to make each iteration as developer-friendly as possible, the Semantic Framework should provide a set of expected features. These features are listed on the left-hand side of Fig. 2 and are mapped to iterations in which they are needed. Owing to these features, the steps comprising each iteration result in attaining the desired status. The intensity of color tags in Fig. 2 reflects the amount of semantics present in each iteration. As can be seen, the first iteration does not involve semantics at all—it is white. Each subsequent iteration is tagged with a deeper shade of orange, representing a gradual enrichment of the initial iteration with semantics. Please note that following each iteration the implementation is runnable and therefore testable, which allows for the verification of additional semantic elements added in each iteration. Iteration A, as mentioned, does not include any semantics. It comprises of five steps, A1–A5, which mostly focus on the business logic. (A1) The service interface is defined in terms of syntactic elements such as input and output parameters. (A2) The business logic of the Service on the provider’s side is implemented in accordance with the interface defined in the previous step. (A3) The logic of Consumer handling the Service invocation is implemented. The implementation uses the dependency injection feature (F1)  to avoid binding to the provider’s code— only the interface from A1 is used. (A4) For testing purposes, the service instance is injected into the consumer code. It is possible thanks to the dependency injection feature. (A5) The implementation of business logic is launched and tested. In case of errors, the logic is fixed and tests are repeated. Successful tests mean that the iteration may conclude, guaranteeing the correctness of business logic (Status A). Iteration B adds minimal semantic support to the result of Iteration A in order to enable checking whether the Semantic Framework is used in the appropriate way. This iteration assumes that the Framework provides two features: F2 and F3 which are essential for the presented Methodology. Feature (F2)—Ontology Placeholder Annotations provides some means for annotating the interface defined in step A1. A set of possible annotations is defined to express semantic meta-data. Attaching a given annotation to some syntactic element simply gives it a certain semantic meaning. This approach is very straightforward and retains clear separation between business logic and representations of both Semantic Expectation and Semantic Description. Annotations are not coupled with any particular ontology. They simply represent the semantic expression of the given Framework. However, since a semantic directive often needs to relate to some ontological Concept (e.g., to represent its meaning), it is assumed that Concepts can be referenced by adding arguments to Annotations. The Ontology Placeholders could be perceived as an ontology skeleton. They define places in which ontology Concepts will be inserted in subsequent iterations. The assumption is that the Placeholders should allow for executing a simplified Match-making algorithm. If the Description and Expectation refer to the same Placeholder which is not yet filled by the ontology, the algorithm should assume that they match. Feature (F3) ensures that the Semantic Framework is able to automatically generate the Service Description and Expectation from the annotated interface. It is expected that these two elements are generated at run-time and therefore do not have to be handled at all by the developer. There are four steps covered by Iteration B: B1–B4. (B1) The developer defines Ontology Placeholders with the use of feature F2. (B2) The developer annotates the interface defined in step A1 and inserts Placeholders as annotation arguments. (B3) Service exposition, on the provider’s end and service invocation on the consumer’s end is adapted to the API of the Semantic Framework. This, of course, implies removing direct injection of the Service instance from the consumer code (added in step A4). (B4) Both implementations (provider’s and consumer’s) are deployed in the platform and the service invocation is tested. If Match-making and the entire invocation cycle succeed, then Iteration B is complete, ensuring the validity of adapting business logic to the Semantic Framework API (Status B). Iteration C focuses on modeling ontology for the purpose of enabling the full potential of semantics. Here, it is expected that the Semantic Framework will provide Annotations which allow for referring to a complete ontology model (F4) and that the Framework will be able to generate semantic-rich Description and Expectation out of these Annotations (F5). The iteration includes only three steps: C1–C3. (C1) The developer (which may be either the provider or the consumer) defines the ontology, including all of its Semantic Concepts. (C2) The provider improves the Annotations created in step B2 by extending the Placeholders from step B1 and referring to the Concepts from the ontology. (C3) The following elements are deployed to the platform: the provider’s code, the consumer’s code and the ontology. This enables service invocation to be tested. If the invocation works, the semantically complete Match-making process is deemed successful, which also means that the ontology and the semantic Annotations of the interface are valid (Status C). Iteration D focuses on more advanced Match-making which is not restricted to a single Expectation and a single Description. Thus far, both the Expectation and Description have been generated from the same development artifact—the interface, initially annotated with Placeholders and later on with ontology Concepts. In such circumstances, it is relatively easy to ensure that the generated elements are matched by the Match-making algorithm. However, in real-life scenarios, the Description and Expectation may be created independently. Therefore, Iteration D expects that the Framework can handle such independence at the development time (F6). The iteration includes the following steps (named D1–D3). (D1) The developer at consumer side starts with a clean syntactic interface from step A1 and annotates it with either ontology Concepts or Placeholders to formulate an independent Service Expectation. (D2) The developer creates or (if possible) uses existing service implementations that have different Semantic Descriptions. (D3) The consumer code (including the independent Expectation), all service implementations and the ontology itself are deployed to the platform. The Service is then invoked under various circumstances involving both the consumer and the provider. Each invocation is followed by a check whether the Match-making algorithm has selected the most appropriate service instance. If not, the Service Expectation is reworked and the test is repeated until a positive result is achieved. This concludes Iteration D (Status D). In the presented description of Methodology, the consumer and provider code was developed from the beginning in a synchronized manner. As mentioned in Iteration D, this is not always the case. The Methodology takes this into account and allows iterations to be performed independently. For example, the provider may have developed the service until Iteration C before the consumer starts work on the client. Even in such cases the completion of each iteration status looks the same. In Iteration A, the service implementation is injected and only the business logic is tested. In Iteration B, only Placeholders are used for generating the Expectation. Finally, Iteration C provides full ontology support for the consumer’s code. As presented in this short example, the potential of the Methodology is preserved even if the consumer and provider perform their work independently. In Sect. 2, a review of existing AAL platforms was presented. Each platform has its own advantages as well as drawbacks; however, one solution stands out from the rest. The universAAL platform is the result of consolidation of a number of other projects (among others SOPRANO, OASIS, and PERSONA). In the scope of the universAAL project, a specification of the AAL Reference Architecture is provided, along with a fully functional distributed platform enabling seamless interoperability. Taking this into consideration, universAAL has been selected as a basis for implementation of a Semantic Framework extension that supports the Methodology proposed in Sect. 3.2. This section describes the relationship between universAAL components and abstract semantic aspects presented in Sect. 3.1, and introduces the universAAL platform extension named Annotation-based Semantic Enrichment (AAPI). Figure 3 presents the mapping of universAAL components to the Semantic concepts defined in Fig. 1. Resources represent the Semantic Concepts used by Providers and Consumers. The Semantic Description is represented by a collection of Service Profiles and their parameters. The Service Callee represents the Provider Implementation and exposes its capabilities in the form of Service Profiles. The Semantic Expectation is represented by a ServiceRequest and its parameters. The Service Caller is acting as a Consumer Implementation and uses the Service Requests to invoke services. From the service provider’s perspective, the process of providing an implementation compliant with the concepts introduced in Fig. 1 involves preparing a Semantic Description of a service and its Provider Implementation which maps to ServiceProfiles and the Service Callee. Listing 1 presents a sample ontological Resource named LightSource which represents a source of light. In universAAL, each Resource has its own specific properties and unique URIs, which distinguish it from other Resources. In this particular case, two properties (color and brightness) are provided and can be managed by some other entities. The Service Profile describes the functional capabilities of a particular service (e.g., turning on the lights, closing the doors etc.) and its relation to specific ontological resources. Listing 2 presents a block of code that creates a profile for turning off the light sources. Line 1 introduces a class which is also described by Semantic concepts and represents the Lighting resource (an ontological service which handles light sources). Line 2 defines the URI which will be used to obtain the resource passed as input. In line 4, an object representation of our profile is created. Line 5 says that this service operation accepts an input parameter of type LightSource, with multiplicity equal to 1, and is accessible under a specified URI. Line 6 adds the description of the effect which will take place following the invocation of this operation. It says that the brightness of the light source will be changed to 0 which means that it will be turned off. In the universAAL platform, all communication between service providers and consumers depends on the buses. The so-called buses are message-based components that enable message exchange as well as exposure of services to consumers. Exposing a service requires registering Service Callee on the bus along with previously created Service Profiles. This operation assures that the implemented business logic will be invoked when consumer requests match the registered Service Profiles. At this point, the analysis of implementation is completed, being the provider’s responsibility (cf. Fig. 1). The following steps are in the responsibility of the service consumer. The process of enabling service semantics from the consumer’s perspective is similar to the provider’s task. The consumer uses the previously designed semantic concepts to perform two actions: express the Semantic Expectation of the required services and develop the Consumer Implementation which directly performs service invocations. As mentioned before, in the universAAL platform, the Semantic Expectation is represented by a Service Request. Listing 3 presents a block of code used for this purpose. In line 3, an initial ServiceRequest is created specifying that it will involve services capable of controlling light sources (cf. line 1 of Listing 2). Lines 4–5 say that this request should be handled only by services that have control over the lamp at the given URI and provide the ability to change its brightness property to 0. Having defined the Semantic Expectations of the consumer, it is possible to create the Consumer Implementation. The Service Caller component publishes the Service Request to the bus where Match-making occurs. In this process, the semantic information of requests is matched with Service Profiles of registered services. If any Service Profile matches the Service Request, then this request is propagated to the Service Callee which registered the profile. If there is more than one match, then all matched callees receive the request. Having processed the request, the Service Callee constructs a response (Service Response) containing the invocation execution status and any additional data, in accordance with the implemented business logic. Each of these responses traverses through the bus back to the consumer. Both the consumer and provider actions according to Fig. 1 have been presented in the context of the universAAL platform. The described process involves only the semantic description of a single operation, yet it still remains complicated and error-prone. The following section describes an approach that produces the same results though in a much simpler way, exploiting the Methodology presented in Sect. 3. This section presents the contribution of the paper in the area of extending the universAAL Semantic Framework which resulted in a tool called Annotation-based Semantic Enrichment (AAPI). As presented in Sect. 3, the Iterative Development Methodology of Service Semantics defines four iterations. Iteration A does not include any semantics therefore will not be discussed further. In Iteration B, it is assumed that AAPI provides features of the Ontology Placeholder Annotations (F2) and Automatic generation of semantic description and expectation (F3). Because the universAAL platform is written completely in Java, the proposed contribution takes into account only this programming language. Therefore, enrichment of services with semantic meta-data is realized with the use of Java annotations. As can be seen in Listing 4, two annotations are directly related to specifying service metadata. The @UniversAALService annotation is used as a placeholder for service-specific properties such as its namespace and name. Depending on the usage context (provider or consumer) of the service interface, these are used either for registration or lookup actions in the bus. It is also assumed that this annotation serves as an indicator for AAPI to begin the process of semantic enrichment for a particular service. If it is not present, the service will not be enriched with semantics. The @OntologyClasses annotation is used to define domain ontology resources which will be used by the service business logic and therefore need to be dynamically registered by AAPI. Listing 5 presents the annotations which can be used for each method of the business interface. Similiarly to the @UniversAALService, the @ServiceOperation indicates that this method should be enriched with semantics. The only parameter of this annotation is the value which specifies a unique name of the operations exposed by the service. There are three more annotations which are used in the process of semantic enrichment: @Input, @Output, and @ChangeEffect. The @Input annotation specifies that a particular parameter has semantic meaning and is accessible under inputParameterName. The @Output annotation has a similar meaning but in the context of invocation results. In the presented example, some results of method invocation are accessible under the name specified by outputParameterName. The final annotation, @ChangeEffect, is used to define the semantic effect of the execution of a given method. In the present case, it states that execution changes the value of some resource (specified by the propertyPaths value) to 0.
each Service Profile is automatically enriched with information on the basis of @Input, @Output, and @ChangeEffect annotations resulting in functionality presented in Listing 2. AAPI generates a Service Callee, enriches it with service-specific properties from @UniversAALService and OntologyClasses and registers it on the bus with previously created Service Profiles. The provided business interface can also be used in the process of developing a Consumer Implementation. It can be passed to the AAPI lookup process which returns a proxy implementing the specified interface. When the consumer invokes a method of such a proxy, AAPI generates a proper Service Request using the information provided in interface annotations, and passes it to the bus. The resulting code corresponds to Listing 3. The described process completes Iteration B. If no errors are identified at this stage, Iteration C may commence. interface method arguments and return values now refer to specific ontological resources. Such annotated interface can be used to test semantic validity and verify that the application works as expected. During the final iteration (Iteration D), it might turn out that some of the ontology resources or business methods are not needed on the consumer side. In such a case, the business interface provided on the consumer side should be abridged, i.e., the list of resources specified in the @OntologyClasses annotation might be trimmed or particular methods deleted. This approach simplifies the Consumer Implementation; however, it does not alter the functional aspects of the consumed service. Furthermore, with the use of AAPI for semantic enrichment, one can easily change the Provider Implementation of the business logic while no changes have to be introduced in other parts of code (on either the consumer’s or provider’s side). This section presents a specific case implementing the proposed solution. The use case focuses on providing universal access to elderly or otherwise impaired persons. The application of the methodology presented in Sect. 3 is thoroughly described. Each of the iterations is analyzed in detail, highlighting the contribution of the paper. The final part of this section contains a discussion of achieved results. The presented case study involves an airport support system for elderly and impaired travelers. The example focuses on communication between services deployed in the airport wireless network and mobile devices carried by travelers. The service is called AirportLocalizer and helps people reach their intended destinations. The methods of the service are shown in Listing 7. The assisted person can ask for precise directions that he/she has to take in order to get to his/her flight, depending on the current location and type of impairment (getDirections() method). Different implementations of the service could be installed in the airport’s infrastructure, each covering a different type of disability. For example, a blind person can obtain directions in the form of instructions read aloud by the mobile device; a person with visual impairment will be directed along routes equipped with Braille inscriptions and tactile pavings; a wheelchair-bound traveler will be directed to elevators rather than staircases, etc. Apart from obtaining directions, the service client may also request the system to call a nearby elevator (methods getElevatorNearby() and callElevator())—in this way, people with serious handicaps do not need to push a call button (which might be invisible or unreachable for them). The service is implemented in accordance with the Iterative Development Methodology, using the universAAL framework extended with AAPI. The following section explains what tasks are undertaken during each iteration. Both providers and consumers differ with respect to the types of targeted handicaps (e.g., directions read by a text-to-speech module or a map displayed on the device screen; avoiding stairs etc.) As a proof of concept, one specific implementation is assumed in iterations A–C (its specific type is irrelevant for evaluation purposes). controlling the state of the elevator upon client request (callElevator()). when approaching the elevator, sending a call request (callElevator()). Finally, by using the framework’s dependency injection mechanisms, the service instance can be injected into consumer code. This allows the business logic to be executed and thus properly tested. At this point, it is assumed that the business logic has been approved. input and output parameters, together with their names (@Input and @Output). Once this step is complete, Service Description and Service Expectation are automatically generated by the framework. During this process, the service is automatically configured to be exposed in the AAL platform. The system also generates a consumer’s invocation, capable of finding the service, wrapping the call into a request, sending it over the platform and unwrapping the received response. Finally, the generated implementations are deployed in the platform and tested again. The Match-making process can now be invoked for the first time. Iteration C covers the ontology development and plugs it into the service. All Semantic Concepts of the AirportOntology are created at this point (this includes all the routes that passengers can take to their flights, information on which routes can be taken by travelers depending on their impairments, elevators and their possible states, location in the airport area) As this paper does not cover ontology definition, the process will not be discussed in detail. Having created the ontology, the placeholders in the interface can be linked to the relevant Concepts (the @ChangeEffect annotation, propertyPaths and filteringClass parameters are added to the interface). The final form of the annotated interface is presented in Listing 8. Lastly, the ontology, along with the provider’s and the consumer’s generated code, is deployed in the platform. The semantically complete Match-making process can now be executed and tested. The development phase of the AirportLocalizer service concludes with the end of Iteration D.
the universAAL framework designed to provide an efficient platform for designing, developing and deploying ready-to-use services within an existing infrastructure. AAPI presented in Sect. 4. Based on the enriched environment, a service supporting universal access was created. Two differing implementations were provided, targeting different types of disability. Both the provider’s and the consumer’s side were linked with a common ontology and synchronized with each other, ensuring seamless communication. The most important advantage of the proposed solution is the division of work into four distinct iterations, making it easier for the developer to handle this otherwise complex and error-prone task. Such incremental development also enables progressive validation of results. Simple mistakes can be easily diagnosed and their causes eliminated. Moreover, the proposed methodology introduces clear separation of concerns. Tasks concerning business logic, ontology modeling and development work on the provider’s and the consumer’s side remain separate. Another advantage is the fact that during the development process, the provider’s and the consumer’s code remain fully synchronized. Implementation of the ontology is easily shared and simultaneously distributed to both sides. This ensures code compatibility and mitigates pernicious programming errors. AAPI delivers these advantages in a fully automatic way, enabling the developer to focus on creating error-free code. The final advantage worth mentioning is that the burden of creating many boilerplate code segments is lifted from the developer. AAPI takes care of automatic code generation, guaranteeing its syntactical and semantical correctness. The amount of code created by the developer using the proposed solution was compared to a scenario without AAPI. The results are shown in Table 1. Regardless of the benefits mentioned above, one drawback of the proposed approach must be acknowledged. Iteration D involves steps similar to iterations A–C, focusing on a different implementation. A mechanism which would synchronize this process and handle large numbers of parallel implementations of the same service would be a significant improvement. In addition to the discussion presented in this paper, a real-life evaluation of the proposed approach was undertaken. AAPI was contributed directly to the universAAL project and met with very positive reception from the developers’ community.2 Unfortunately, this is not evidenced by any citeable scientific document. Taking the above into consideration, AAPI is a highly promising solution. The approach represented by the AAL environment have thus far lacked appropriate tooling support. The system presented in this paper remedies this situation. Several conclusions can be drawn on the basis of the presented study. The proposed Iterative Development Methodology of Service Semantics tackles the inherent complexity of the development process. Each development task, such as implementation of business logic or ontology modeling, is enclosed in a separate iteration. Results of each iteration are directly deployable and testable, which reduces the risk of errors. The features identified by the Methodology could be perceived as a recipe for a simple and user-friendly Semantic Framework. They free the developer from having to manually develop and maintain Service Descriptions and Service Expectations. They also automate extensive parts of consumer’s and provider’s implementations. In order to assess the novelty of the presented work, the AAL platforms presented in Sect. 2 were analyzed in the context of the features expected by the proposed Iterative Development Methodology. Table 2 contains the summary of the support for these features provided by the reviewed platforms. The feature fulfillment is marked with (1) “\(+\)”—when a feature is fully supported; (2) “\(-\)”—when a feature is not supported; or (3) “\(+/-\)”—when a feature is supported partially. The cases of full and partial feature support are now elaborated. The SOPRANO platform provides its middleware components exposed via well defined APIs, though does not let developers describe services semantically in a declarative manner, e.g., with annotations (F4). The Composer component of the SOPRANO platform performs match-making between service instance and abstract semantic description. Thanks to that, feature F6 is fully supported. The OASIS project provides the mechanisms for tagging the business services with semantic information. The mechanism involves mapping specific web-services operations to the ontologies stored in repositories.3 Such approach allows for achieving complete support for feature F2. The need for the development of an additional layer in the form of web-services which are well isolated from specific business logic but contain semantic information enables full support for F6. Regarding the MonAMI approach, F2 is partially supported by introducing a two-level mapping: services to functions and functions to devices (sensors/actuators) . Having this, the independence between Service Expectation and the Description at the development time (F6) could also be achieved. In the PERSONA and universAAL projects, the F4 and F6 features are partially supported (both projects present the same fulfillment of the features because PERSONA was the input project on which universAAL was heavily based)—the functionalities are implemented though are not usable in a straightforward manner. Developers are unable to specify the semantics declaratively and a significant amount of boiler-plate code still needs to be written manually, which can lead to hard to diagnose run-time errors. The feature of Dependency Injection is fully supported in almost all analyzed projects. All projects, beside OASIS, are based on the OSGi technology which provides a capability of Declarative Services and, starting from version 4.2 of OSGi specification , the Blueprint Container. Both capabilities allow for the realization of the Dependency Injection pattern. In the case of the OASIS project, there are mechanisms that partially support the feature of Dependency Injection. It is realized not by means of injecting dependencies in the business logic, but injecting the services necessary for given application on the basis of ontological description. The whole process is realized in an automated way by an internal component called AMI Framework. The analysis of the reviewed AAL platforms in the context of features expected by Iterative Development Methodology shows that the support for these features was not extensively provided. Therefore, none of the platforms allows for direct realization of the proposed Methodology. In particular, features related to automatic enrichment (F5) and code generation (F3) specific for the given Semantic Descriptions and Expectations (which significantly simplifies the development process of services semantics) are not supported by the current AAL platforms. Moreover, it is apparent that the separation between semantics and the business logic (F2, F4) is not handled properly in most of the projects where those two elements are tightly coupled with each other. The conclusions resulting from the AAL platforms analysis ensure that the proposed approach for seamless semantic service enrichment is a novel concept. The proposed Methodology aids the development of service semantics to the extent which was not achievable before. The applicability of the proposed Methodology has been verified using a fully featured implementation—the Annotation-based Semantic Enrichment (AAPI)—an extension of the universAAL platform Semantic Framework. Evaluation performed using a sample scenario related to accessibility support shows that the development of semantics becomes simpler and less error-prone compared to existing tools. Additional good feedback from the universAAL community strengthens these evaluation results. Taking all of the above into consideration, it can be said that the proposed Methodology and AAPI directly enhance the potential of the universAAL platform and increase its chances for gaining broad acceptance on the AAL market. Although the presented Methodology was implemented for universAAL, this is just one of its possible realizations. The Methodology is founded on abstract semantic aspects, common to many different AAL platforms. Thus, it can conceivably be reimplemented for other AAL platforms. Current work on the Methodology and AAPI focuses on service interactions. In the context of future work, the authors would like to extend proposed solutions with asynchronous event-oriented interactions and with interactions focusing strictly on the user interface layer. Especially the latter improvement would allow for addressing recent challenges of universal access  and therefore increasing the extent to which the solutions proposed support the developer in the implementation and maintenance of truly accessible applications. The propertyPaths parameter has Airport.MOVEMENT_IMPAIRMENT instead of Airport.BLIND_IMPAIRMENT in @Output annotation of the getDirections() method because the semantics of that method change according to the impairment type. Documentation of AAPI is provided on the following site http://forge.universaal.org/wiki/support:RD_Core_AAPI In order to access it a registration of a free account is needed. The mapping is performed with the use of Content Anchoring and Alignment Tool. The research presented in this paper was partially supported by the Polish Ministry of Science and Higher Education grants no. 15.11.120.264, 15.11.120.268 and also by the European Community’s Seventh Framework Programme (FP7/2007-2013) under grant agreement no. 247950.